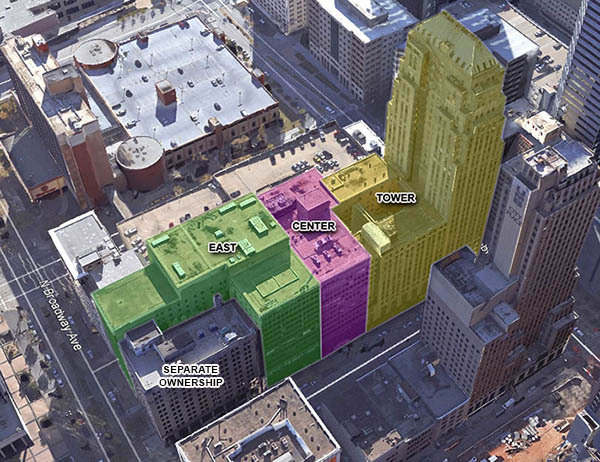 As part of a larger plan by developers Gary Brooks and Charlie Nicholas to completely redevelop First National Center in the heart of downtown, some details have been revealed for a boutique hotel that will fill much of the historic tower. 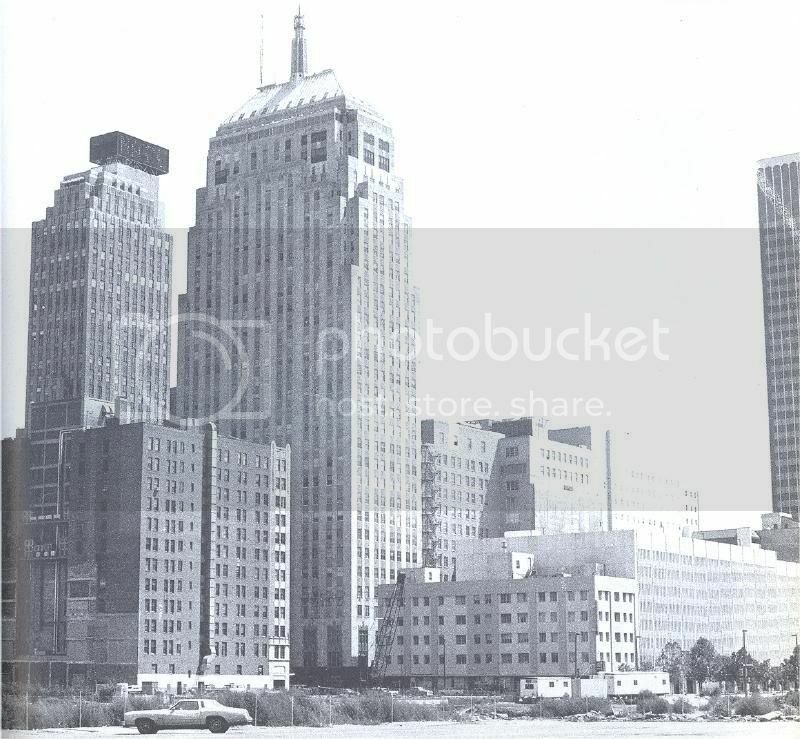 The original developers of OKC's Ambassador and Colcord Hotels propose 149 rooms in the office tower built in 1932, while the center and eastern part of the complex – built later and not considered historically significant – would give way to structured parking with some amount of commercial space at ground level. Dubbed The First, the boutique hotel would be operated by Coury Hospitality with the hopes of joining Marriott's Autograph collection, of which the Ambassador Hotel in Midtown joined in 2012. Coury also redeveloped the Colcord Hotel which like First National was formerly office space as was the Ambassador. 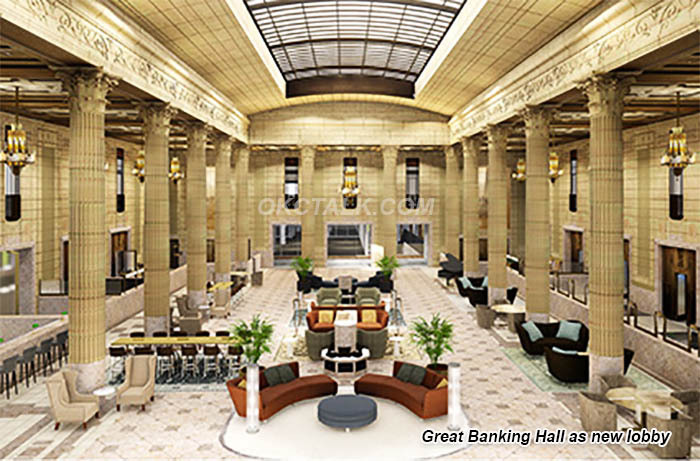 Besides the hotel rooms, the Great Banking Hall would be renovated and repaired to be used as a public lobby, event space and museum. 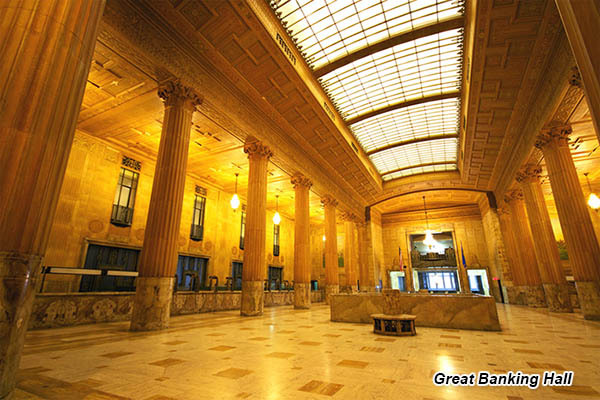 Under the plan, murals, elaborate ceilings, stonework, vaults, safes and other metal finishes would be restored in the grand hall located on the second level of the office tower. Earlier this week at the Downtown Year in Review forum hosted by the Oklahoman, Brooks said he hopes to close on the property by January 11th and would start renovation work soon thereafter. According to Cathy O'Connor with the Alliance for Economic Development, in addition to the hotel and parking, there would be 210 apartments, two restaurants, 35,000 square feet of commercial space, a rooftop pool and other amenities. Brooks and Nichols have been working with O'Connor and the Alliance to receive several financial incentives, including the creation of of a Tax Increment Finance (TIF) district exclusively for the First National Project. The entire complex is currently closed and vacant in anticipation of the pending sale and renovation. The hall reminds me a lot of the Palmer House Hotel in Chicago. It is even on the 2nd floor. Coury is the perfect group to do this, as they already have done a wonderful job with the Colcord and Ambassador and I like that they are locals and obviously care a great deal about this property and hall, as we all do. There is also talk of a private club at the top, ala the old Beacon Club. Can't wait to see this moving forward! while the center and eastern part of the complex – built later and not considered historically significant – would give way to structured parking with some amount of commercial space at ground level. Although the buildings may not be historically significant, they provide good density along the street. I'm hoping the above statement means that the structures will stay in place and the will be redeveloped to parking etc. I think we would lose good density if they were torn down and replaced with a parking garage. There was a pretty nifty, albeit very preliminary, rendering of what the structured parking could look like and as I recall it showed both of these buildings being demolished for a large, new garage. The plan is to take down the existing structures but build the parking facilities almost as high and to the street, so the density won't change. Especially because those buildings have been largely vacant for a very long time. Not really losing anything as long as there is retail/commercial at street level. I would hope and expect that they will pack as much ground-floor retail in as is possible... Especially with adding residential units to the CBD, ground floor retail is going to continue to grow in importance. It'd be killer if they could carve out enough space in the parking garage for a drugstore type of business like Walgreens or CVS. Will be very interesting to see what becomes of the retail space along Robinson formerly occupied by Cafe 7 and the Tinder Box. Really excited about this finally moving forward and the good news is that it seems this will be done the right way and be more than worth the wait. Yes, I'm incredibly excited to watch this building come back to life too, especially considering the parties involved. This gem has been underutilized and abused for far too long and it's time for it to be restored to it's former glory. Also, 200+ apartments in the middle of the CBD is a very good thing, particularly for those who worry that the center of downtown is entire too dead after 5PM. it would be cool if some the older portion being converted to parking could be utilized for housing as well. Then fill park with retail and amenities! There is a park across the street too. Yes, that figure jumped out at me as even more exciting than the hotel. I knew there was going to be apartments involved, but didn't realize it would be that many! This is a really great deal and it being done by locals they understand the importance of the building. I love that there's going to be apartments and that that will add life to downtown. Also, there's just something that feels big city about high rise apartments. Won't it be wonderful to see lights in most of those windows at night? That rarely even happened when it was an office building. Do we know if this renovation will include any cleaning work on the exterior of the building, and/or improving the lighting of the crown? I want to see it have a working beacon again. I believe the answer is yes to both. You used to be able to see that beacon all the way from Okarche. Are they still considering the pop-up tower on the east side facing Broadway? Sort of on-topic: Coury Hotels has won Trip Advisor's 2017 award for #20 hotel in the U.S. for the Ambassador Kansas City. Is this the building that had the Time and temp display at the top? I kinda miss that. No, that was the old Liberty Bank Tower (currently, City Bank Tower); aka Ramsey Building/APCO Tower. What OKC downtown development-related person deserves a big gift from Santa this year? And who should get coal in their stocking? The gifts go to Gary Brooks, who has taken on the first genuine effort to bring First National back to life. The work, the challenges and complications have been mind-boggling. And the coal goes to those who I will not name but through either greed or ignorance have acted at various times to derail the project. We've reached the end of another year and still the First National Center appears to be an orphan. Assure me that those grandiose plans for a hotel, apartments and retail really will move forward. Gary Brooks is doing everything he can to get it started. I will name names and ask tough questions if anyone succeeds in derailing this project. I'm very confident this project is going to happen. We should see a closing than immediate movement not long after the first of the year.